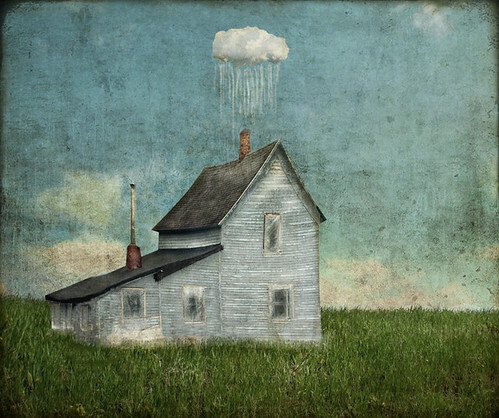 Above the farmhouse down on Highway C, a raincloud hovers perpetually. Old Mrs. Montgomery, who has lived there for as long as anyone can remember, falls asleep every night to the pitter patter of the rain. When she ventures into town for groceries or a haircut, she is met with a respectful silence from the villagers. Mrs. Montgomery knows they talk about her. She sees them point and whisper. But, of course, they’re all perfectly cordial. They bag her groceries with care and tip their hats and say good morning, Mrs. Montgomery. They know, as does she, that the very livelihood of the village depends on that perpetual raincloud above the Montgomery house. The water from her roof gathers into a river that runs into town. Along the way, it irrigates the crops, keeps the livestock healthy, and powers the mills. Here’s what the villagers don’t know: Mrs. Montgomery used to live elsewhere. Her husband was a fisherman, and he came home each night, smelling of sea salt and fish guts. He snored while he slept; it sounded like waves crashing on the beach. He was a hard worker; he made good money. But then the storm hit. The high winds whipped the sea into a frenzy. It rained without end. When the empty boat washed up on shore, Mrs. Montgomery vowed never to gaze upon the sea again. She didn’t want to face the killer of her dreams. So she moved inland. The storm followed her. It lost some strength as it crested the mountaintops. It shrank when it crossed the desert. But eventually, it settled on the prairie with Mrs. Montgomery and refused to leave. When something sticks around for that long, you have to come to peace with it. Even if it scares you. Every once in a while, as Mrs. Montgomery is drifting off to sleep, she imagines her husband snoring. She dreams that he lives with her still, here in this prairie house. She dreams that he wakes early and fishes the river of rain. He sells his fish in town, greeting the villagers with a smile. When she wakes to an empty bed, in the disorientation of early morning, the dream seems true. She storms out of bed, mad at him for leaving without waking her. Down the stairs she runs, and when she steps out the front door, she shouts, “Get back here!” Only the waves of prairie grass respond, shushing her with their plaintive whispers. In the distance, smoke from a few chimneys curls skyward from the village. She looks up at her raincloud and clutches the collar of her blouse. “I’m sorry,” she says out loud. “Forgive me.” She goes back inside. I’ve learned that if you go to Radio Shack for an A/V cable of any kind, you need to take a visual aid with you. It’s otherwise impossible to communicate to Radio Shack employees what you’re looking for. He showed me a couple of options. One was $20 and the other $30. “What’s the difference?” I asked. I made my choice, and at the cash register, he asked if I needed any batteries. Awkward silence. I signed for the purchase.